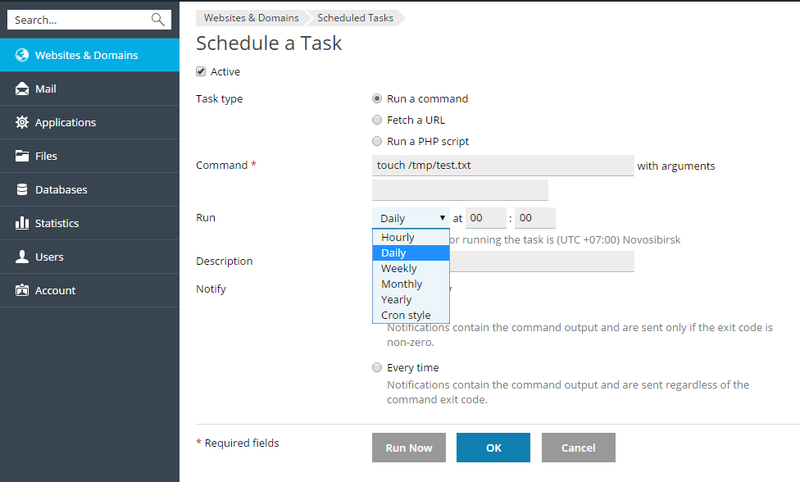 If you need to run scripts on your hosting account at a specific time, use the task scheduler in Plesk to make the system automatically run the scripts for you. For every task in the list you can change the settings of the task (by clicking on the task's name), activate it by clicking the icon, deactivate it by clicking the icon, or run the task immediately. Fetch a URL. Specify the URL only; there is no need to type the command, such as "curl" or "wget". Next, select how often the task will run, and set the desired time and date. By default the time is in the server time zone; if you need to select a different time zone, go to Websites & Domains tab > Scheduled Tasks > Settings. You can also set a description for the task, and configure notifications.